The Lennox SL280V can be matched* with many Lennox air conditioners and evaporator coils. The three components together make a complete central heating and cooling system. This model is the pride and joy of Lennox’s 80% efficient furnaces. Magic Touch Mechanical provides furnace installation and service throughout the Greater Phoenix Metro area and surrounding cities in Central AZ. As we have moderately mild winters in this part of Arizona, 80% furnaces are the most common efficiency found in the area. Colder areas may want to consider a 90+ efficiency furnace. *An AHRI Certified matched system is required to achieve published efficiency levels. It is unwise and in many places illegal for an HVAC Contractor to install a non-certified matchup. Natural gas and propane furnace efficiency is measured in AFUE (Annual Fuel Utilization Efficiency). The higher the AFUE rating number, the less it costs to operate. A 90% AFUE furnace is 10% more efficient than an 80% AFUE furnace – as the numbers suggest. That said, if you live in a colder climate like Flagstaff or Denver, a 90% or higher furnace is probably a good idea. Here in the Valley of the Sun (Phoenix Metro) there is a better ROI when investing more in a higher efficiency air conditioner than furnace. We do have homes here with 90% furnaces aka condensing furnaces, but it’s rare. 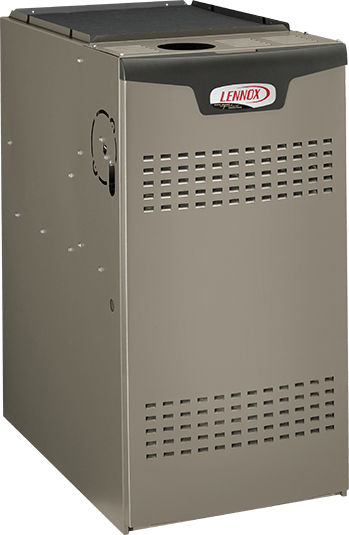 According to Lennox, the SL280V is “4.5-times quieter than competitive models.” They attribute their claim that this model is “practically silent” to its heavily insulated cabinet and extremely quiet variable speed motor. Having installed hundreds if not thousands of SL280’s since it first came to market, we have to agree – this model is quieter than any furnace we’ve ever heard. The Lennox SL280V variable speed motor works in conjunction with its two-stage gas valve. The end result is perfectly choreographed fan speed and airflow for optimal comfort. This variable speed motor also controls your indoor air in the cooling season when matched with a number of Lennox air conditioners including the XC25, XC20, and others. That means quiet and efficient performance all year long. Peace of mind. That’s what you’ll have knowing your Lennox SL280V is covered by an excellent manufacturer warranty! The heart of any furnace is its heat exchanger. The heat exchanger is the the largest and most expensive component inside the Lennox SL280V – it’s covered for 20-years! The remaining components are backed by a 10-year factory parts warranty. In other words, you’re covered! You will not be disappointed if you choose the Lennox SL280V to complete your central heating and cooling system. The smart electronics built-in work in conjunction with Lennox communicating controls like the iComfort and Lennox S30 to provide precise comfort. You’ll know longer have to turn up the volume on your TV every time the heat comes on. In fact, the only reason you’ll know the Lennox SL280V is running is because your home will be warm and comfortable.